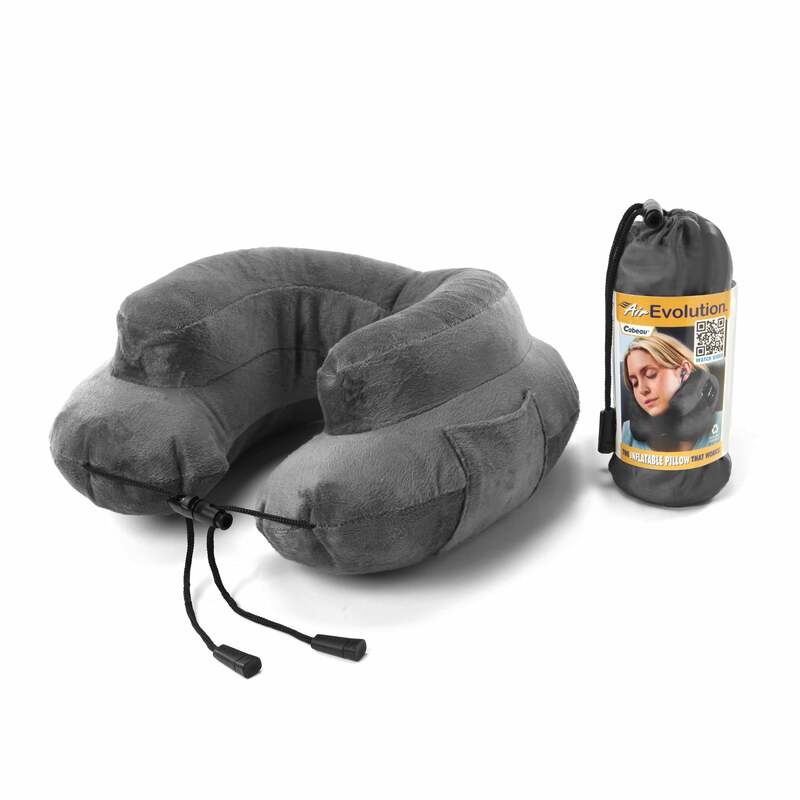 Cabeau's patented Air EvolutionTM is the first inflatable travel pillow that actually works! (1) Made with an inflatable air core (2) Includes a removable/machine washable velour cover (3) Uses an adjustable sliding front toggle to hold the pillow in place (4) Has raised side supports helping to create 360° comfort (5) Designed with a flat rear cushion that won't push your head forward (6) Features a media pouch to hold your phone or MP3 player (7) Comes with its own water repellent travel pouch that compacts the pillow down to the size of a soda can! Because of its portable compactibility, the Air EvolutionTM neck pillow can also be used for road trips, sunbathing by the pool or beach, outdoor camping, and travel in the car, bus, plane, or train. It only takes one time using it to understand why people are calling this the best neck pillow in the world. Attaches to bags or purses and allows the pillow to compress to the size of a soda can for quick and convenient packing. Support can be adjusted to your ideal comfort level for long-lasting head support. The environmentally-friendly plastic can be surface cleaned and is wrapped with a removable and machine-washable super-soft velour cover. Prevent your head from falling sideways. If your head tends to fall forward, spin the pillow around backwards and you have a chin rest with full frontal support. Can be adjusted to hold the pillow in place and provide additional head support. Offers smooth comfort to your neck, unlike those sharp plastic edges found on other inflatable pillows. The cover is also removable and machine-washable to help eliminate germs. Holds your phone or mp3 player, allowing you to listen to your music hands-free, lap-free, and pocket-free.